With spring’s arrival, one can’t help but daydream about greener pastures, or in my case, lawns. Now is the time for spring lawn maintenance. The main purpose of spring lawn care is to get the turf through the summer months. Cool-season grasses such as Kentucky bluegrass, perennial rye grass, and the fescues need to develop a strong root system to survive summer’s heat and dry conditions. There are a number of things you can do to ensure that your lawn gets off to a good start in the spring. Listed below are some things to do in April and May. Rake up debris from the lawn with a stiff metal rake. Using a stiff metal leaf rake, go through your lawn and rake up any trash, debris, and fallen branches. This is a good time to asses your lawn to see if there has been any damage from the long winter months. Examples would be salt damage or dead spots, as well as any physical damage from animals or plows. Ideally, compost the leaves, stems, and other plant debris you rake up. Aerating is by far the most important practice that you can do to help improve the quality of your lawn. Core aerating is the process of inserting hollow tines into the lawn and removing plugs of soil using specialized equipment. This practice will help reduce soil compaction and thatch. It also opens up the soil to let in nutrients and oxygen, and improves soil drainage. This practice should be done at least twice a year — once in the spring and again in the fall. If you can only do it once in a season, I would recommend early to mid-September. A seed spreader works well for seeding large areas of lawn. Once you get a chance to inspect your lawn, you may find a number of areas that need to be filled in. Inspect the area that you are going to work on and determine if it is in full sun, full shade, or a combination of the two. This is very important when choosing the correct type of grass seed to use in the area. When working in a full-sun area, a blend of Kentucky bluegrass and turf-type perennial rye grass works best. For a full-shade area, a fine-leaf fescue works best. If your area is a mixture of part shade and part sun, then you would want to go with a mixture of the three types of grasses. Scratch up the area so that you get all of the debris off of the soil. You want to have exposure to bare soil. Sprinkle on a light-to-medium layer of seed over the top of the soil, and very lightly rake it into the top 1/4 inch. It is very important that the seed come in contact with the soil. Cover the seed with about 1/8 inch of a very fine compost or peat moss and water with a fine spray. You will need to make sure that the seed stays moist every day for about two weeks, or until the seed begins to germinate. Then you can slowly back off on the watering. Write down your lawn’s square footage so there’s no guesswork in fertilizer purchases. Fertilization is a very important part of a lawn care routine, as it influences the color of the grass and its ability to recover from the stress of the long season, and helps prevent weed infestations and disease. There are some very important features to consider when you travel to your local garden center to buy your fertilizer. Knowing the square footage of lawn that you have on your property will enable you to purchase the right amount of fertilizer for your home and prevent multiple trips to the garden center. Once you have figured out the square footage, write it down for future reference. Nitrogen (N), phosphorus (P), and potassium (K) are the three major nutrients needed by your lawn. Nitrogen is the nutrient needed the most, although you do need to be careful because excess nitrogen can lead to abundant top growth and sometimes even kill the lawn if applied improperly. On a bag of fertilizer you will see three numbers, such as “21-3-20.” The first number is nitrogen, the second is phosphorus, and the third is potassium. They are all in percent by weight. For example, the 21-3-20 fertilizer contains 21 percent nitrogen. This number is important because it determines how much fertilizer is needed. In most cases, a rate of 1 pound of nitrogen per 1,000 square feet is suggested for each fertilizer application to your lawn. Recommended ratios of N-P-K for lawn fertilizers include 3:1:2 or 4:1:2. I recommend a controlled-release nitrogen source for your fertilizer, which would be indicated on the label of your fertilizer bag. With a slow release, you will see a more uniform grass growth. It is unlikely to burn the grass or cause losses through the soil and air. I recommend at least three fertilizer applications per season for best results and to help out-compete most weeds. 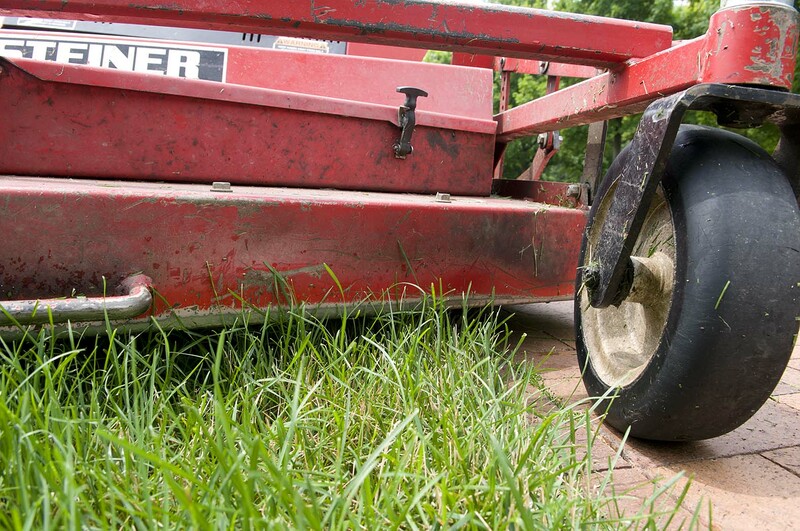 Check the height of the mower blade with one wheel on a path to avoid cutting grass too short. As soon as the grass needs cutting, mow it. Do not wait. Most cool-season grasses should be cut at a height of 3 to 3 1/2 inches in height. When you cut the grass at this height, it develops a thicker and denser stand of turf, and can out-compete most weeds. In addition, it will help conserve water by shading the bare soil and reducing evaporation during the heat of the day. Always use sharp mower blades. I recommend sharpening the blades every week. Keep a spare blade on hand so that you can quickly change them out. Don’t collect your grass clippings — let them fall back into the soil to decompose and add some nutrients back. Contrary to popular belief, they do not contribute to a thatch buildup in the lawn. Purchasing a set of mulching blades for your mower will help. They are available at most big box retailers. With these few tips, you should be off and running to having the best lawn on the block. And remember, the grass is always greener in your yard.